Anything in particular you'd like to focus on during our 30-minute conversation? Social media can be intimidating. It’s not always clear what success looks like or how to get there. The Measuring Social Media Success Flowchart helps identify social media goals and how to measure progress. Marketers and business owners can agree on the importance of a brand’s social media presence. The brand awareness and loyalty that is built through daily engagement on these channels is something that cannot be argued. While these benefits are real, they are often difficult to measure. 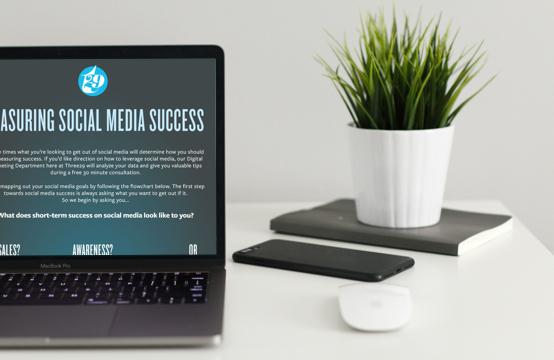 There are a number of reasons why setting social media goals can be difficult, however, these complications shouldn’t keep you from bragging about all of the good work you’ve done on Facebook, Twitter or Instagram. When we develop a social media campaign, we start with a very simple question: what do we want users to do immediately? Obviously, the long-term goal is to make sales and earn more money, however social media isn’t quite that simple. We broke potential short-term objectives of a campaign down into three main actions; Sales, Social Media Presence or Online Awareness. There are longterm benefits to building an engaged community, however, Facebook and Instagram also have very powerful advertising tools that can be used to run effective advertising campaigns. These advertising campaigns are often the quickest and most effective way to generate sales. When running these types campaigns, more traditional digital advertising statistics will be your best bet to measure success. As mentioned earlier, there are undeniable longterm benefits to creating an active and engaged social media presence. As you build towards a larger audience you will find that it becomes increasingly easier to reach users outside of your audience as well. While you are working to gain traction and establish yourself among followers, engagement statistics, follower growth, and community activity are some of the statistics that will be most helpful. Facebook, Twitter, Pinterest and other social media channels can be used to generate familiarity with your website. This is often the objective of new businesses or new product launches. The goal for a campaign such as this is not always to immediately drive a sale, but to generate interests or at least knowledge of the site’s existence. Basic website performance statistics are the best fit for this strategy. The exact statistics and figures we recommend can be found in the Measuring Social Media Success Flowchart. You’ll likely end up using a combination of these actions throughout the course of your marketing strategy, so understanding what success looks like for each is beneficial. If you have questions about how social media marketing can help your business, contact us for a free 30-minute consultation. Start measuring your social media success. Download The Measuring Social Media Success Flowchart now!